Bills Bikes Toy Run for Palm Beach Kids & Toys For Tots! . . . A biker Fundraiser! 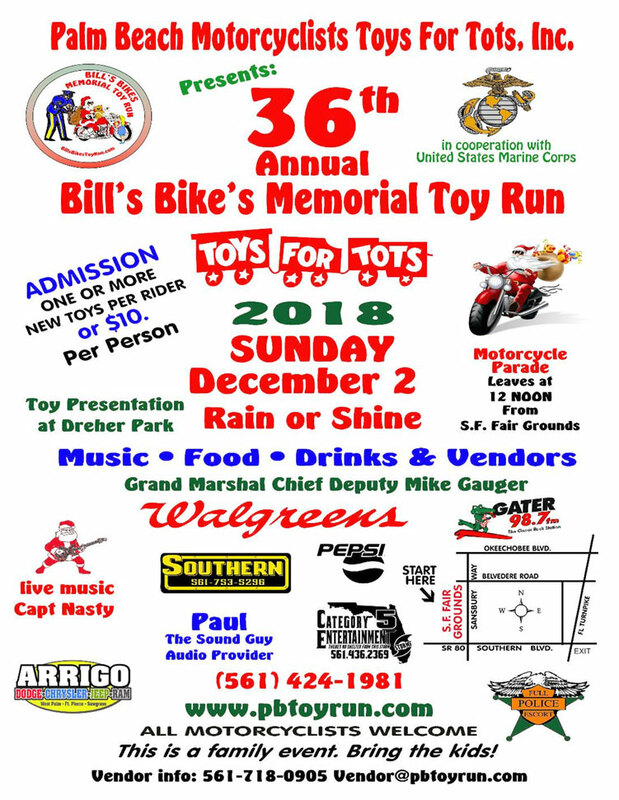 The annual Bill's Bikes Toy Run is a huge undertaking and requires quite a large number of volunteers to help pull off successfully! If you would care to volunteer to help out for the day . . .
please complete form and submit! The answer is Jane . Please enter only the answer in this field! Read 2010 Article - Click Here Click Here to download 2018 flyer .PDF ! this entire site copyright© 1987 ---> 2012,2013,2014,2015,2016,2017,2018,2019 Contact Us West Palm Beach, FL.